One of the most important tasks of the 24th Session of the Conference of the Parties to the United Nations Framework Convention on Climate Change (COP24) will be to work out and adopt a package of decisions ensuring the full implementation of the Paris Agreement, in accordance with the decisions adopted in Paris (COP21) and in Marrakesh (CMA1.1). Moreover, COP24 will include the so-called Facilitative Dialogue intended to support the implementation of national commitments. In the course of the 2018 Climate Summit Poland would like to demonstrate how neutrality in terms of greenhouse gas emissions - in other words, a balance between CO2 emissions and its sequestration by soils and forests - can be attained. UNDP's engagement at COP24 features a wide range of activities over 10 days in various locations. To get a full overview of UNDP's events taking place from Monday, December 3, to Thursday, December 13, please download our PDF. 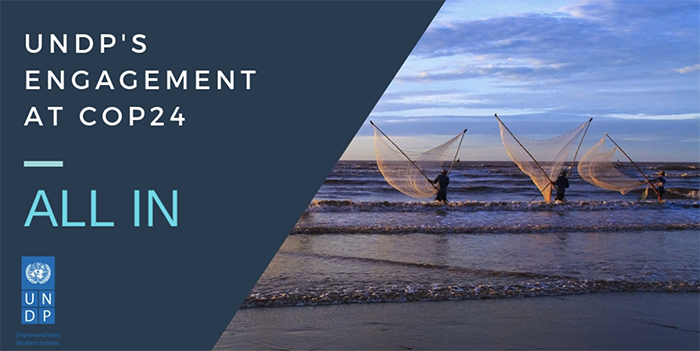 See the overall COP 24 programme here. Showcasing the power of young people as key players in reaching innovative and ambitious solutions to combat climate change. The inaugural Investment COP will be the first convening of countries, project developers, investors and other stakeholders to design and mobilise investment projects. One UN side event on SDG15: Forests first. From 10 years of REDD+ to the full scope of nature-based climate solutions. 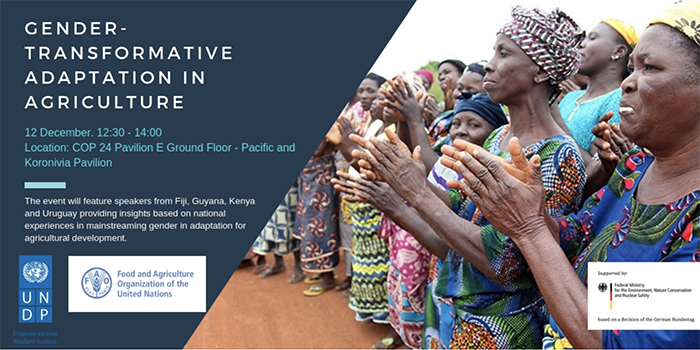 The event will feature speakers from Fiji, Guyana, Kenya, Tonga, and Uruguay providing insights based on national experiences in mainstreaming gender in adaptation for agricultural development. Defining a new path to mainstream and accelerate climate change adaptation in Africa. The Adaptation Fund (AF) will discuss new innovation grants to help advance its often groundbreaking concrete adaptation work for the most vulnerable. AF’s contributions and value to serving the Paris Agreement will also be highlighted. 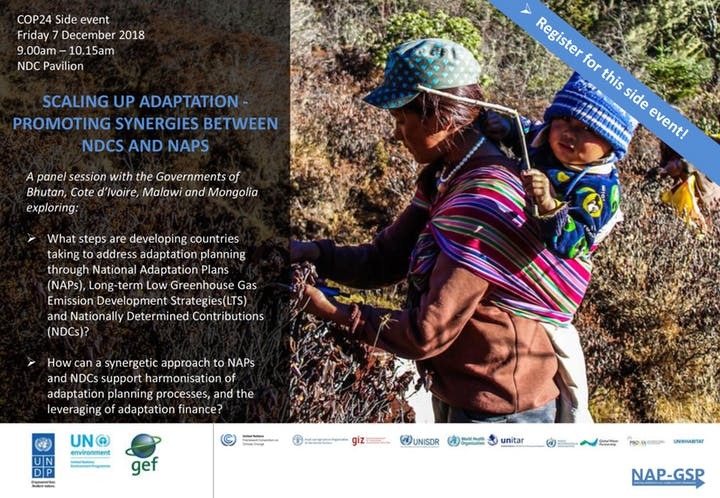 In the event, UNDP will explore the successes and lessons learned from ongoing partnerships with the Adaptation Fund to pilot adaptation initiatives across the world, and look to new opportunities to replicate, scale-up, mainstream and accelerate these successes. 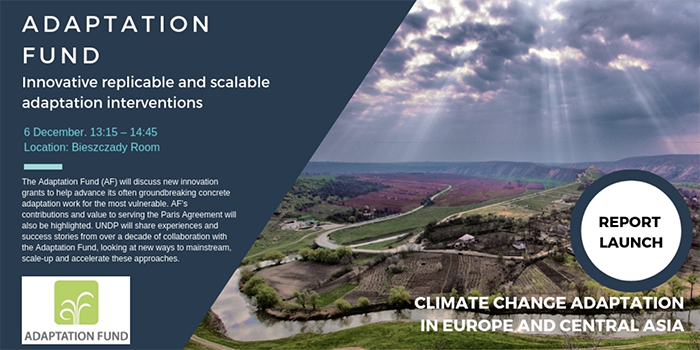 UNDP will also launch a report on climate change adaptation in Europe and Central Asia at the event. Capacity-building for developing countries is crucially important to the implementation of Nationally Determined Contributions (NDCs) and therefore achieving the goals of the Paris Agreement. The Agreement has elevated the importance of capacity-building to new heights by enshrining two separate Articles on the issue (Article 11 and Article 13). The need to transition to a low emissions pathway and deal with the impacts of climate change will increase as we move from one generation to the next. Capacity-building, a means for implementing climate resilient (adaptation) and low emissions (mitigation) strategies will therefore need to be designed to sustain in the long‐term as well. 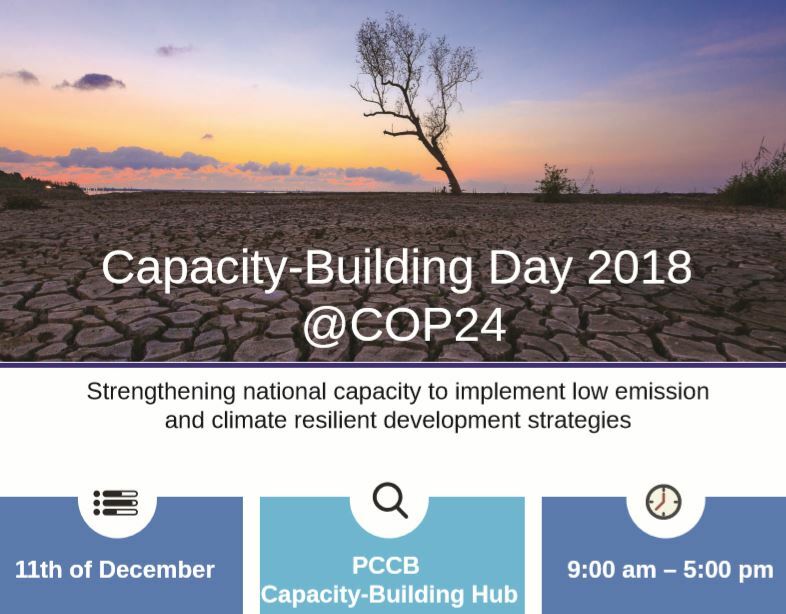 The Second Annual Capacity-Building Day 2018 to be organized as a side event during COP24 will bring together diverse communities of practice to have in-depth discussions on building national capacity to implement low emissions and climate resilient development strategies. 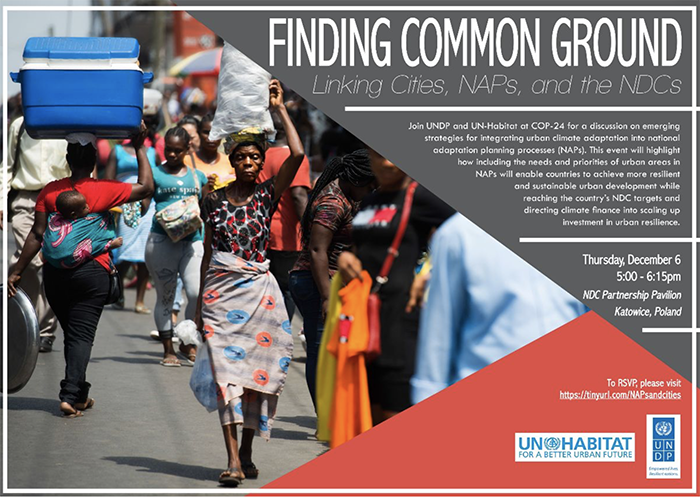 This side event is designed to spark discussion on successful and transformative approaches that can be scaled up and replicated in countries, including in Small Island Developing States, to achieve the system-wide impacts needed that will transform gender and climate change commitments into concrete results and benefits for rural populations. The event will feature country speakers providing insights based on national experiences in mainstreaming gender in adaptation for agricultural development, in line with the UNFCCC Gender Action Plan. Panellists will include representatives from Fiji, Guyana, Kenya and Uruguay. Light lunch and coffee will be served. 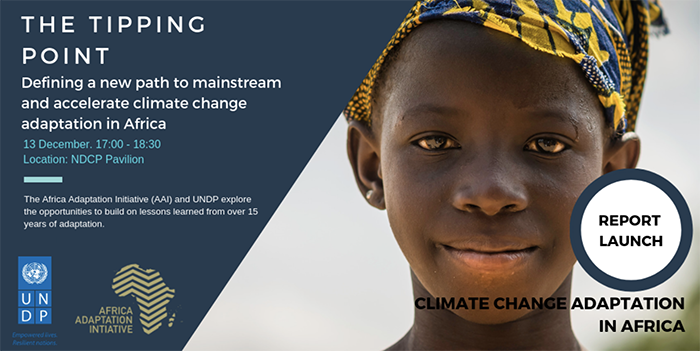 Given that temperatures in Africa are rising, and are set to rise faster than the global average during the 21st Century, it is time to mainstream, scale-up and accelerate support for climate change adaptation across the continent. In this joint event with the Africa Adaptation Initiative (AAI) and UNDP, we will explore the opportunities to build on lessons learned from over 15 years of adaptation work in Africa with the launch of a UNDP flagship publication on "Climate Change Adaptation in Africa" and an expert panel, including experts from developing countries, UNDP, AAI, and vertical funds. These signposts lay the groundwork needed to tap Africa’s vast resources and human talents to transform the continent and ensure a brighter future for generations to come, while at the same time providing valuable insights into global efforts to mainstream and accelerate climate actions in Africa and across the globe.